Ride on the nation's oldest steamboat, the Belle of Louisville (www.belleoflouisville.org), which still sails along the Ohio River. Go trailriding in Big South Fork National River and Recreation Area (www.nps.gov/biso), a national park wilderness straddling the Kentucky-Tennessee border. Hike in Cumberland Gap National Park (www.nps.gov/cugo) with its breathtaking views of the Appalachian Mountains. The Cumberland Falls, known as the 'Niagara of the South', is one of the few places in the world where you can see a 'moonbow' (lunar rainbow). Canoeing and rafting trips are popular. Explore the vast Daniel Boone National Forest (www.fs.fed.us/r8/boone), with its magnificent Red River Gorge that runs through the entire region. Two of Kentucky's most beautiful lakes, Cave Run Lake and Laurel River Lake, lie at each end of the forest. See the Falls of the Ohio State Park (www.fallsoftheohio.org), where visitors can walk onto the world's largest exposed Devonian fossil bed. Travel to Harrodsburg, the oldest permanent English settlement west of the Alleghenies. Old Fort Harrod State Park contains part of the replica 1774 fort. Actors dressed in 18th-century costume demonstrate skills, such as blacksmithing and quilting. Visit Hodgenville, the birthplace of Abraham Lincoln. Lincoln's Boyhood Home (www.nps.gov/liho) is a reproduction cabin located on the original site where he lived until he was eight years old. The Abraham Lincoln Birthplace National Historic Site (www.nps.gov/abli) has 56 steps, one for each year of his life. Tour the Jim Beam Distillery (www.jimbeam.com) and sample some of Kentucky's famous bourbon whiskey. 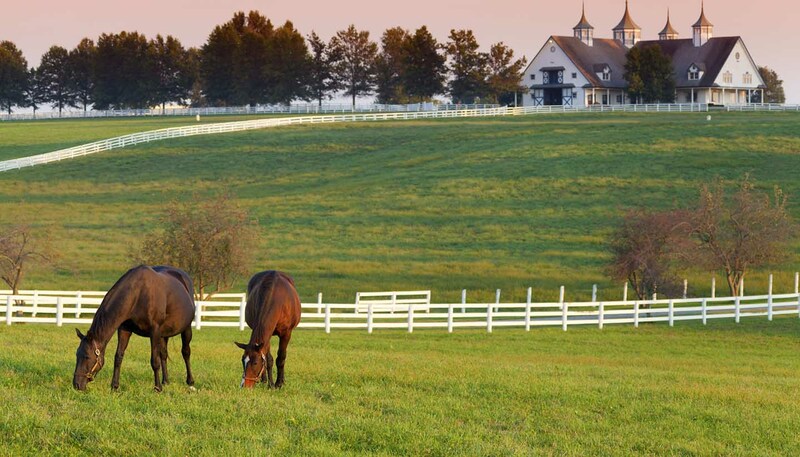 Visit the Kentucky Horse Park, a working horse farm in Lexington. Enjoy an educational look at the state's equestrian history, then watch films about horseracing and breeding, and demonstrations of horseshoeing and harness making. Tour the nearby International Museum of the Horse and the American Saddle Horse Museum (www.imh.org). Thrill to the sights and sounds at the Kentucky Speedway (www.kentuckyspeedway.com), a motor racing circuit located 18km (30 miles) south of the Cincinnati/Northern Kentucky International airport. Hike, fish, trailride and view nature in her majesty at Western Kentucky's Land Between the Lakes, a National Recreation Area. The peninsula is surrounded by Kentucky Lake and Lake Barkley (www.kentuckylake.com). Take the family to the Lexington Children's Museum (www.explorium.com). Many exciting exhibits can be touched and explored by children, including a Bubble Factory and the Science Station X. Get into the horse racing spirit in Louisville during the two weeks of Derby celebrations which climax with the most important date on Louisville's calendar - the famous Kentucky Derby (www.kentuckyderby.com), held the first Saturday in May at Churchill Downs. Descend underground into Mammoth Cave (www.nps.gov/maca), the largest-known network of natural caves and underground passageways in the world, with more than 560km (350 miles) of explored passageways. Tours vary from 30 minutes to six hours. Above ground, the park offers miles of hiking trails. Tour the National Corvette Museum (www.corvettemuseum.com) in Bowling Green, home to one of America's best known sports cars. Tours of the corvette assembly plant are also available. Canoe, kayak or raft one of Kentucky's 14 major river systems. Rockcastle is one of the most popular white-water canoe runs in the USA. Tour Shaker Village of Pleasant Hill (www.shakervillageky.org). Members of the 19th-century Shaker religious sect lived a simple life here. Today visitors can tour their 2,024-hectare (5,000-acre) farm and living history museum. Hike or backpack two major trails through the scenic forested highlands of Eastern Kentucky - the Sheltowee Trace National Recreation Trail (www.sheltoweetrace.com) and the Jenny Wiley National Recreation Trail. Follow the Stars of Country Music Highway US-23 and visit the birthplaces of country music and bluegrass stars Patty Loveless, Dwight Yoakam, Loretta Lynn, the Judds and Billy Ray Cyrus. See Loretta Lynn memorabilia at the Kentucky Coal Mining Museum (www.kingdomcome.org/museum) in Benham.